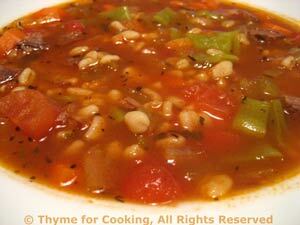 Beef Barley Soup, Thyme for Cooking easy Supper Soup. This was one of my favorite soups as a child, though I ate the condensed, canned version, not home made. This is ever so much better. The recipe calls for canned beef stock, but if you would like to make your own, (I did) that recipe is below. There will be enough soup for 2 meals - cook once, eat twice. Cut beef into bite-size pieces. Add beef and brown well. Remove and set aside. Take the meat off any bones, trim off any fat and cut into bite-size pieces. Heat stock in soup pot. Slice carrots into 1/4" (.6cm) rounds - cutting in half if too big. Slice celery the same size as the carrots. Cut beans into 1/2" (1.25cm) lengths if using fresh. If using frozen beans, rinse under hot water and cut if needed. Chop tomatoes, reserving all juices. Add all ingredients, including beef and juices from tomatoes, to stock as they are prepared. Add barley, herbs and bring to a boil. Cover, reduce heat and simmer for 30 - 40 minutes, until vegetables are tender and barley is done. Serve. It's best to make this the day before using, to allow ample time for chilling so you can remove the fat. You can leave this simmering on the stove top for hours. Make more, divide into 1 cup portions and freeze it. Or reduce it, to concentrate the flavors, and freeze in ice cube trays, then put into freezer bags. Heat oil in large pot. Brown the beef very well on all sides over medium high heat, about 20 minutes. Add the remaining ingredients and enough water to just cover the meat, or 10 cups, whichever is more. Cover and simmer over low heat for several hours. Remove meat and chill until needed. Strain soup and chill at least 2 hours - this allows the fat to congeal on the surface for easy removal. Once fat is removed, stock can be boiled to reduce liquid and concentrate flavors.